In our last blog post, we reviewed the 7 characteristics of paper that have a direct impact on the efficiency of your equipment. Quality materials will conform to vendor specifications and US Postal Service publications. Testing is an integral function to ensure that your materials meet industry standards. Your quality paper and forms also need to be stored properly. 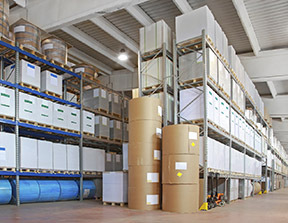 If you use an offsite warehouse, ensure the warehouse has some type of climate control. If your operation is located in an area with extreme weather conditions (e.g., very cold or very hot), climate control is especially important. Keep the storage area's climate consistent. The temperature should stay between 64 and 80 degrees Fahrenheit. Relative humidity should be maintained between 40 and 60 percent. Invest in a wall monitor that displays and records temperature and humidity readings. Report any significant fluctuations to facilities management, and schedule quarterly meetings to discuss any improvements. Materials should be stored in their original packaging for as long as possible. The cardboard and shrink-wrap provide added protection from climate changes. Also, the covering will minimize any damage when moving paper from storage to the production area. You should also store material up and away from concrete floors and walls. Install shelving with at least a four-inch clearance from the walls. If shelving is not an option, use the pallets on which the papers and forms were delivered. You'll need to recondition material after moving it from storage to the operations area, allowing the paper to sit in the same environment as the equipment to adjust to the climate change. The greater the temperature change, the more time the material will need for reconditioning. Vendors recommend at least four hours for every 10 degrees in temperature change. However, whenever possible, allow 24 hours of reconditioning for optimum performance. It's important to establish a method of continuous monitoring of material quality. Set up a quality control station to test all new applications and forms. Train the receiving area to spot and report any damage as shipments arrive. Work with the U.S. Postal Service, consultants, paper suppliers and equipment vendors to set standards and testing procedures. Track and report the effects that poor quality materials have on production time. And remember that paper suppliers use different mills and factories to produce your forms. While the bulk of the forms may come from one facility, the vendor may need to redirect work due to time constraints, capacity issues or disaster recovery. Require that testing be done at each mill/factory, using the same standards. Ensure the paper source is identified on all packaging and bills of lading. Printer and inserter manufacturers are "pushing the envelope" on how fast their machines can process a piece of paper. New inks, glues and finishing elements create new opportunities for how companies can produce creative hardcopy messages. But that technology is dependent on using quality paper and forms. For the immediate future, paper will retain its importance as the preferred method for receiving bills and statements. Physical mail is an essential component in integrated marketing campaigns. Start a quality program now for your paper and forms, and take advantage of new technology to produce superior documents for your customers and prospects.